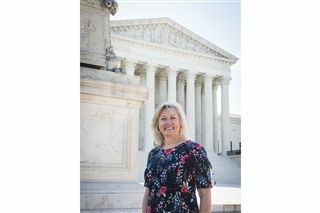 In June, Humanities IX Chair and History Teacher Sarah Cunningham attended a week-long institute, “Federal Trials and Great Debates,” in Washington, DC. Through classroom discussion, guest lectures, and visits to the courts, twenty teachers from across the nation examined how the federal courts work and how historical cases still impact important issues today. Dr. Cunningham explains: “This program deepened my knowledge of the judicial branch of government and reignited my passion for the pursuit of truth and justice. As we unpack pivotal cases in my U.S. History classes, I will be sure to highlight the long arc of history: judicial decisions are made by real people within the context of their time and affect people long into the future.” A highlight of the program was a visit to the Supreme Court and a personal meeting with Justice Ruth Bader Ginsburg.